, one of the most learned and eloquent of the fathers, was born at Antioch, of a noble family, about the year 354. His father, Secundus, dying when he was very young, the care of his education was left to his mother, Anthusa. 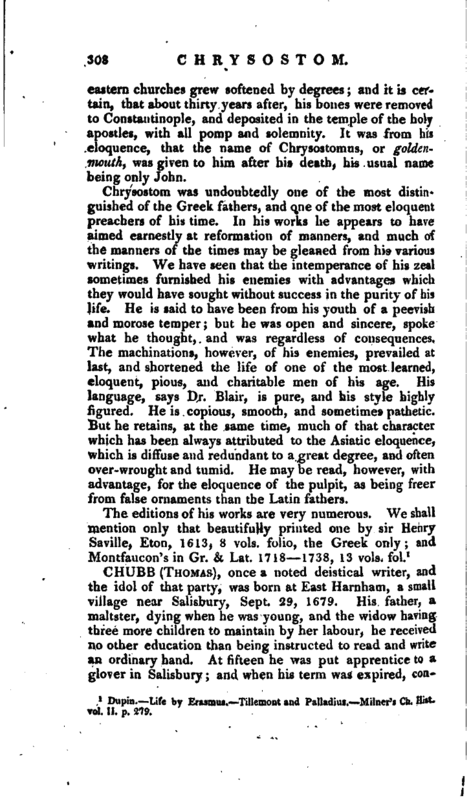 He was designed at first for the bar, and was sent to learn rhetoric under Libanius; who had such an opinion of his eloquence, that when asked who would be capable of succeeding him in the school, he answered, “John, if the Christians had not stolen him from us.” He soon, however, quitted all thoughts of the bar, and being instructed in the principles of the Christian religion, was afterwards baptized by Meletius, and ordained by that bishop to be a reader in the church of Antioch, where he converted his two friends, Theodorus and Maximus. While he was yet young, he formed a resolution of entering ugon a monastic life, and in spite of all remonstrances from his mother, about the year 374, he betook himself to the neighbouring mountains, where he lived four years with an ancient hermit; then retired to a more secret part of the desert, and shut himself up in a cave, in which situation he spent two whole years more; till at length, worn out almost by continual watchings, fastings, and other severities, he was forced to return to Antioch, to his old way of living. He was ordained deacon by Meletius, in the year 381, and now began to compose and publish many of his works. Five years after, he was ordained a priest by Flavian, in which office he acquitted himself with so much reputation, that, upon the death of Nectarius, bishop of Constantinople, in the year 397, he was unanimously chosen to fill that see. The emperor Arcadius, however, was obliged to employ all his authority, and even to use some stratagem, before he could seduce Chrysostom from his native Antioch, where he was held in so much admiration and esteem. He sent in the mean time, a mandate to Theophilus, bishop of Alexandria, to consecrate Chrysostom bishop of Constantinople; which was done in the year | 398, notwithstanding the secret and envious attempts of Theophilus to prevent it. But Chrysostom was no sooner at the head of the church of Constantinople, than that zeal and ardour, for which he was afterwards famous, was employed in endeavouring to effect a general reformation of manners. With this disposition, he begun with the clergy, and next attacked the laity, but especially the courtiers, whom he soon made his enemies; and his preaching is said to have been eminently successful among the lower classes. 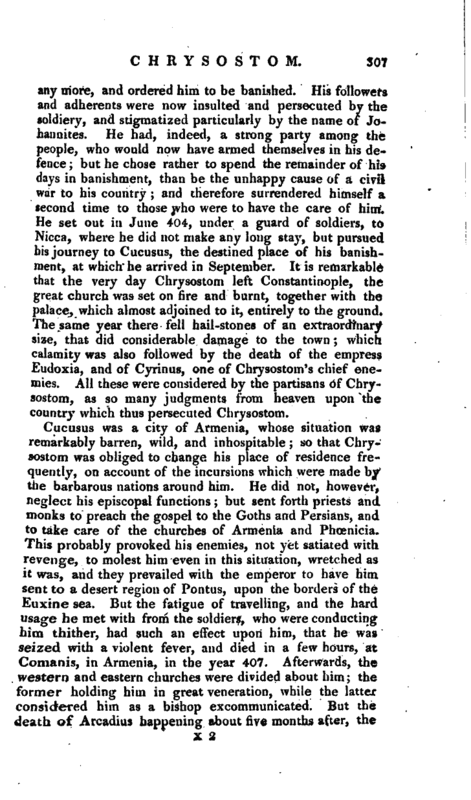 Nor was his zeal confined altogether within the precincts of Constantinople; it extended to foreign parts, as appears from his causing to be demolished some temples and statues in Phoenicia; but all writers are agreed that his temper, even in his best duties, was violent, and afforde’d his enemies many advantages. In the year 400, he went into Asia, at the request of the clergy of Ephesus; and by deposing thirteen bishops of Lydia and Phrygia, endeavoured to settle some disorders which had been occasioned in that church. But while he was here, a conspiracy was formed against him at home, by Severian, bishop of Gabala, to whom Chrysostom had committed the care of his church in his absence, and who endeavoured to insinuate himself into the favour of the nobility and people, at Chrysostom’s expence. 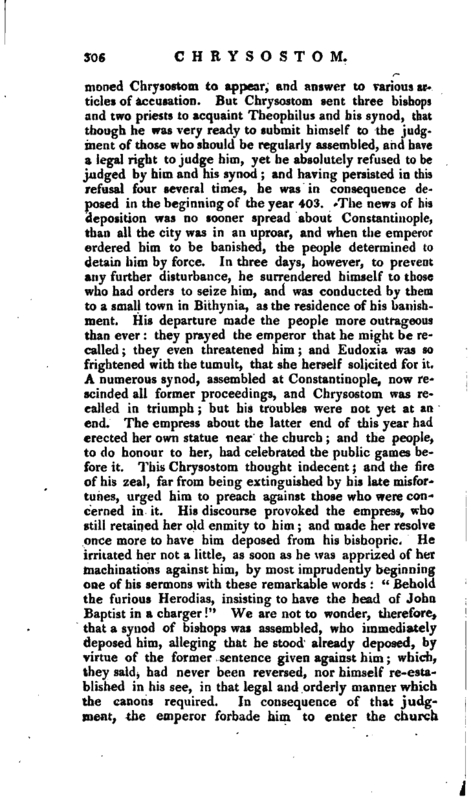 He had even formed a confederacy against him with his old adversary, Theophilus of Alexandria, which the empress Eudoxia encouraged, for the sake of revenging some liberties which Chrysostom had taken in reproving her. 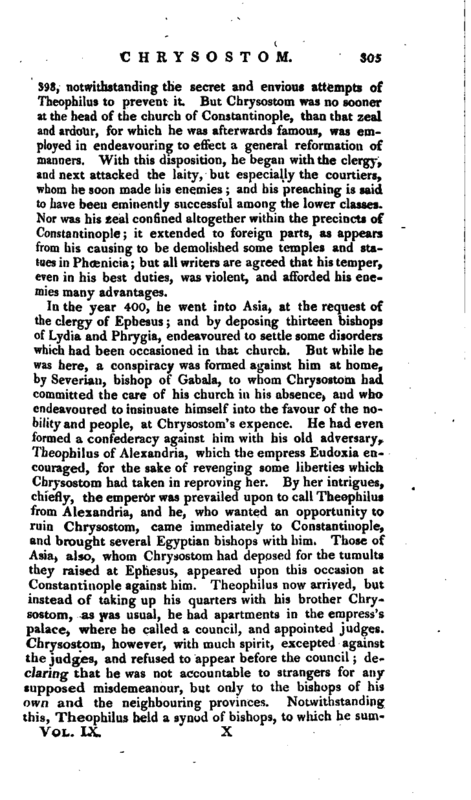 By her intrigues, chiefly, the emperor was prevailed upon to call Theophilus from Alexandria, and he, who wanted an opportunity to ruin Chrysostom, came immediately to Constantinople, and brought several Egyptian bishops with him. Those of Asia, also, whom Chrysostom had deposed for the tumults they raised at Ephesus, appeared upon this occasion at Constantinople against him. Theophilus now arrived, but instead of taking up his quarters with his brother Chrvsostom, as was usual, he had apartments in the empress’s palace, where he called a council, and appointed judges. Chrysostom, however, with much spirit, excepted against the judges, and refused to appear before the council; declaring that he was not accountable to strangers for any supposed misdemeanour, but only to the bishops of his own and the neighbouring provinces. Notwithstanding this, Theophilus held a synod of bishops, to which he | sumtnoned Chrysostom to appear, and answer to various articles of accusation. But Chrysostom sent three bishops and two priests to acquaint Theophilus and his synod, that though he was very ready to submit himself to the judgment of those who should be regularly assembled, and have a legal right to judge him, yet he absolutely refused to be judged by him and his synod; and having persisted in this refusal four several times, he was in consequence deposed in the beginning of the year 403. The news of his deposition was no sooner spread about Constantinople, than all the city was in an uproar, and when the emperor ordered him to be banished, the people determined to detain him by force. In three days, however, to prevent any further disturbance, he surrendered himself to those who had orders to seize him, and was conducted by them to a small town in Bithynia, as the residence of his banishment. His departure made the people more outrageous than ever: they prayed the emperor that he might be recalled; they even threatened him; and Eudoxia was so frightened with the tumult, that she herself solicited for it. A numerous synod, assembled at Constantinople, now rescinded all former proceedings, and Chrysostom was recalled in triumph; but his troubles were not yet at an end. The empress about the latter end of this year had erected her own statue near the church; and the people, to do honour to her, had celebrated the public games before it. This Chrysostom thought indecent; and the fire of his zeal, far from being extinguished by his late misfortunes, urged him to preach against those who were con* cerned in it. His discourse provoked the empress, who still retained her old enmity to him; and made her resolve once more to have him deposed from his bishopric. He irritated her not a little, as soon as he was apprized of her machinations against him, by most imprudently beginning one of his sermons with these remarkable words: “Behold the furious Herodias, insisting to have the head of John Baptist in a charger!” We are not to wonder, therefore, that a synod of bishops was assembled, who immediately deposed him, alleging that he stood already deposed, by virtue of the former sentence given against him; which, they said, had never been reversed, nor himself re-established in hk see, in that legal and orderly manner which the canons required. In consequence of that judgment, the emperor forbade him to enter the church | any more, and ordered him to be banished. His followers and adherents were now insulted and persecuted by the soldiery, and stigmatized particularly by the name of Johannites. He had, indeed, a strong party among the people, who would now have armed themselves in his defence; but he chose rather to spend the remainder of his days in banishment, than be the unhappy cause of a civil war to his country; and therefore surrendered himself a second time to those who were to have the care of him. He set out in June 404, under a guard of soldiers, to Nicca, where he did not make any long stay, but pursued his jourrjey to Cucusus, the destined place of his banishment, at which he arrived in September. It is remarkable that the very day Chrysostom left Constantinople, the great church was set on fire and burnt, together with the palace, which almost adjoined to it, entirely to the ground. The same year there fell hail-stones of an extraordinary size, that did considerable damage to the town; which calamity was also followed by the death of the empress Eudoxia, and of Cyrinus, one of Chrysostom’s chief enemies. All these were considered by the partisans of Chrysostom, as so many judgments from heaven upon the country which thus persecuted Chrysostom. Cucusus was a city of Armenia, whose situation was remarkably barren, wild, and inhospitable; so that Chrysostom was obliged to change his place of residence fre* quently, on account of the incursions which were made by the barbarous nations around him. He did not, however, neglect his episcopal functions; but sent forth priests and monks to preach the gospel to the Goths and Persians, and to take care of the churches of Armenia and Phoenicia. This probably provoked his enemies, not yet satiated with revenge, to molest him even in this situation, wretched as it was, and they prevailed with the emperor to have him sent to a desert region of Pontus, upon the borders of the Euxine sea. But the fatigue of travelling, and the hard usage he met with from the soldiers, who were conducting him thither, had such an effect upon him, that he was seized with a violent fever, and died in a few hours, at Comanis, in Armenia, in the year 407. Afterwards, the western and eastern churches were divided about him; the former holding him in great veneration, while the latter considered him as a bishop excommunicated. But the death of Arcadius happening about five months after, the | eastern churches grew softened by degrees and it is certain, that about thirty years after, his bones were removed to Constantinople, and deposited in the temple of the holy apostles, with all pomp and solemnity. It was from his eloquence, that the name of Chrysostomns, or goldenmouth, was given to him after his death, his usual name being only John. Chrysostom was undoubtedly one of the most distinguished of the Greek fathers, and one of the most eloquent preachers of his time. In his works he appears to have aimed earnestly at reformation of manners, and much of the manners of the times may be gleamed from his various writings. We have seen that the intemperance of his zeal sometimes furnished his enemies with advantages which they wduld have sought without success in the purity of his life. He is said to have been from his youth of a peevish and morose temper" but he was open and sincere, spoke what he thought, and was regardless of consequences. The machinations, however, of his enemies, prevailed at last, and shortened the life of one of the most learned, eloquent, pious, and charitable men of his age. His language, says Dr. Blair, is pure, and his style highly figured. He is copious, smooth, and sometimes pathetic. But he fetains, at the same time, much of that character which has been always attributed to the Asiatic eloquence, which is diffuse and redundant to a great degree, and often over-wrought and tumid. He may be read, however, with advantage, for the eloquence of the pulpit, as being freer from false ornaments than the Latin fathers. 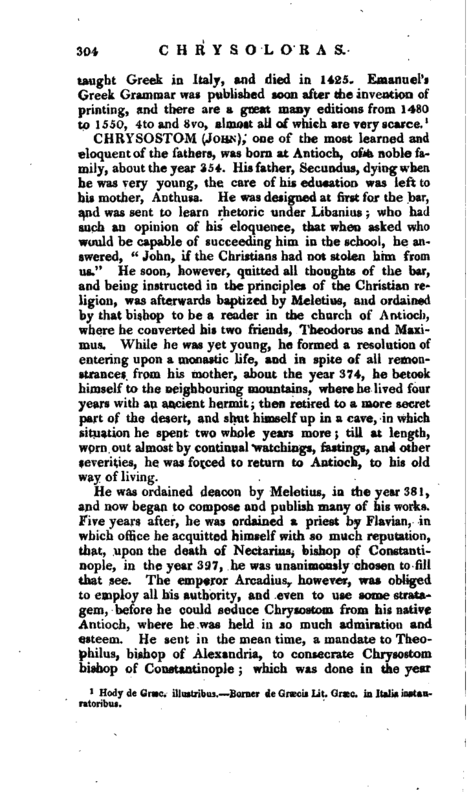 Dupin.—Life by Erasmus.—Tillemont and Palladins.—Milner’s Ch. HistH vol. II. p. 279.